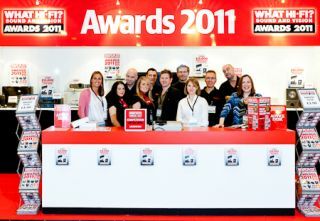 Manchester Show 2011: old vs new tech, 3D gaming and a 103in plasma | What Hi-Fi? We’re celebrating 35 years of What Hi-Fi? Sound and Vision at the Manchester Home Entertainment Show this weekend, so we’ve put together a spectacular demo on our stand in the Galileo Suite here at the Renaissance Hotel. We thought it would be fun to compare the performance of some of our Award winners from years past, and the latest 2011 hi-fi and home cinema models, to see just how far the hi-fi and home cinema experience has improved in the last three decades. Technology has come a long, long way since we published the first issue of the magazine in 1976. Compact cassette gave way to CD, VHS to DVD and now Blu-ray, and this year wireless streaming is all the rage. So, what have we got in our demo room (above)? Well for starters, we’ve wall mounted a £140,000 Panasonic 103in plasma 3D TV for a superb cinema-size image. That’s paired with our 2011 Award-winning Blu-ray player, the Panasonic DMP-BDT210. As for surround sound, we have a 7.1 B&W CM9 speaker package with a pair of DB1 subs at £4000 each. They’re driven by this year’s Award-winning Pioneer SC-LX85 multichannel receiver. Visitors will be able to see and hear the system in action with streaming high-definition music, and Star Wars and Four on Blu-ray. But that’s not all: we’ll be comparing the latest hi-tech formats to some familiar old friends from the past. You won’t believe the difference! And don't forget to have a go in our 3D gaming section (above, with our very own expert Andy Madden) where you can try your skills on Gran Turismo 5 in 3D on a Sony PS3. So join us here at the Manchester Show this weekend to experience the ultimate in hi-fi and home cinema, and discover just how much technology has improved since 1976.